The last morning of February feels like the first day of spring. The redbud is finally beginning to bloom, surrounded by a circle of elegant white irises. A squirrel perches on the walnut tree stump, teasing Daisy who watches from the deck. The owl looks outside his box, catching the morning light. Underneath all this warmth and signs of new spring life, winter lingers. The great horned owls called to each other this morning. I could hear them while I was still lying in bed, so they must have been close, and I wonder where they are nesting this year. Gold finches visit the socks filled with thistle hanging on the shepherd’s hooks. So far there have been three American gold finches who hang upside down, prying the thistle out, or perching on the shepherd’s hook waiting for a chance to feed. The barn is soggy and wet. On Sunday Willis was covered in dirt from head to hoof and by the time he was groomed and somewhat clean, it began to thunder. Rain pounded the metal roof of the barn while Willis danced nervously in the cross-ties. He does not like storms or rushing rivers of rain; he will not even walk through a puddle. So I released him from the cross-ties and led him into Orsini’s empty stall and waited for a few minutes. We tried this two times before the rain let up enough to let Willis graze for a short while and return him to his paddock. When I left the barn the rain really started coming down. The sun came out on Monday, but not enough to ride in either arena. Willis was even dirtier than he was on Sunday, so I groomed him enough to put his saddle on and walked around the arenas and out to the field. Mud squished under his hooves as we made our way past horses turned out in paddocks. Some were frisky while others munched contentedly on their hay bales. 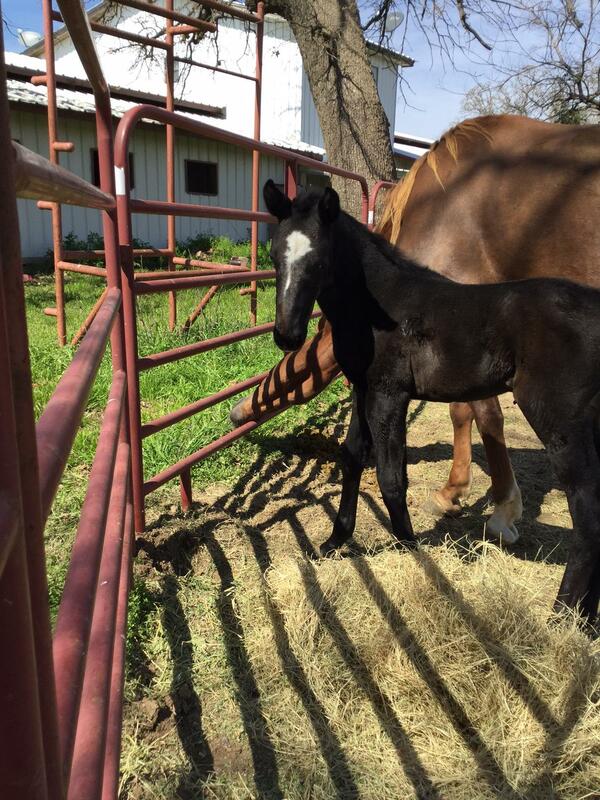 There is a new baby at the barn, a little black filly with a blaze on her face. 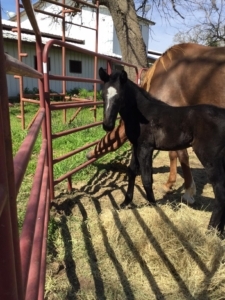 She is the result of Stacie’s young stud colt, Gray Boy, sowing his oats before Stacie could have him gelded. 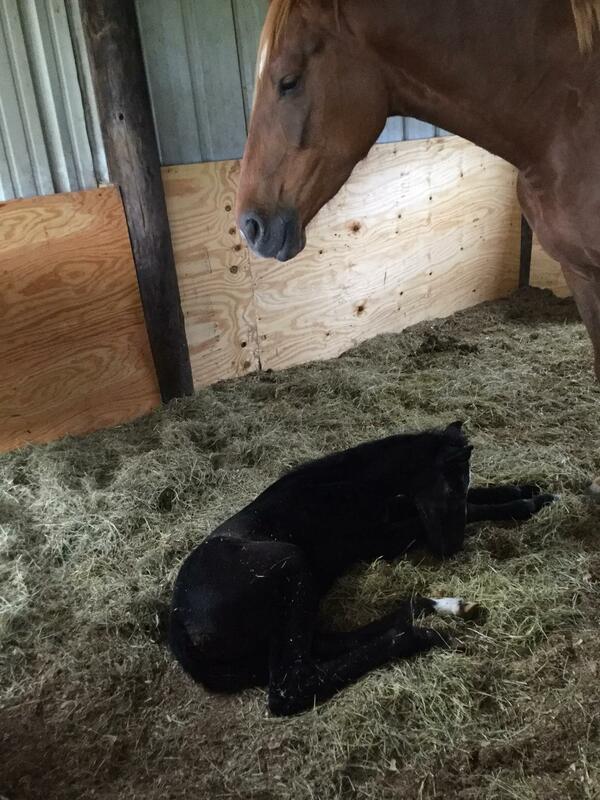 Funny – the AI on Stacie’s mares did not take, but through Gray Boy Stacie gets a “free” horse. The sky brightens and I wait for more rain. The ground is finally soft enough to plant or pull weeds. A pair of titmice dive to the feeder and grab sunflower seeds before blue jays scare them away. Time to get ready for Daisy’s walk. Nice Christine! Lovely article, nice to see the little filly!